John Wall scored 30, Bradley Beal had 27 and Jeff Green added 20 as the Washington Wizards rallied from 24 points down to beat the Los Angeles Clippers 125-118 on Tuesday night. WASHINGTON (AP) — There has been a lot of negativity around the struggling Washington Wizards in recent days. When they fell behind the Los Angeles Clippers by 24 points midway in the second quarter, the Wizards didn’t fall apart again. Instead, they rallied for their biggest win of the season. Amid a 5-11 start, there were reports the team would listen to trade offers for All-Star guards Wall and Beal, and talk of a nasty practice last week with Wall yelling at coach Scott Brooks and being fined for disrespectful behavior. Wall, Beal and Green each scored 10 in the fourth quarter as Washington outscored Los Angeles 39-23 to pull out the win. The Wizards cut the Clippers lead to 95-86 after three quarters and took a 115-113 lead on Wall’s layup with 2:33 to play. 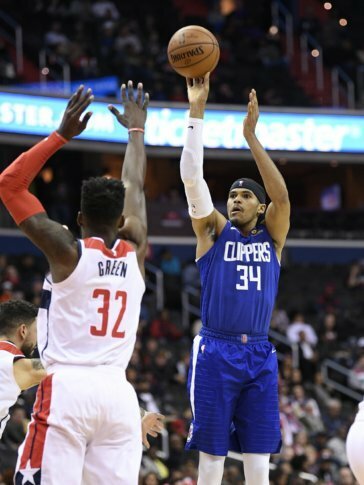 Tobias Harris scored a season-high 29 points, Montrezl Harrell had 20, and Lou Williams and Shai Gilgeous-Alexander each added 17 for the Clippers, who had won five straight. Williams was ejected with 34.5 seconds to play. Clippers: C Luc Mbah a Moute missed his 12th straight game with a sore left knee. … Rivers said it wasn’t a problem to face his son, Austin, who was traded from Los Angeles to Washington in the offseason. “We should have that one down tonight,” Rivers said. “If we mess that one up, I’m going to go off on the whole team.” The Clippers held Austin Rivers to two points. … G Tyrone Wallace left the court after a violent collision with Beal late in the third quarter. Wallace held a towel over his left eye as he departed, but Rivers said he had tested negatively for a concussion. Wizards: C Dwight Howard was out with a glute injury. Howard missed the season’s first seven games with the injury. Thomas Bryant received his first NBA start and scored seven points in 19 minutes. … F Kelly Oubre, Jr. started in place of Markieff Morris. It was the first time Morris came off the bench since Feb. 28, 2016. Oubre committed five fouls in 12 minutes. Williams, who Rivers said was subpar because of illness was ejected after being assessed a technical foul. Generally, two technical warrant ejection. “I felt like we were playing through a lot of contact and I didn’t think that Washington was playing through a lot of contact, and I wanted a real answer why that was,” Williams said. Brooks defended Wall from talk that he was soft and slow. Brooks said that Wall suffered a bruised thigh in the season’s second game, and played through it for several games. “He didn’t say one word, and I wasn’t going to say it,” Brooks said. Wall had little to say about the tenor of the team after the game. Clippers: Host Memphis on Friday. Wizards: Visit Toronto on Friday.